For the last six months, we've been harbouring an animal, a secret pet of sorts, in our house. It's a pretty unusual one, to say the least. I've known people who had similar pets, but they kept theirs contained behind glass. Ours is allowed to roam free, although she tends to stay in one spot most of the time. A day ago, I noticed that our pet was missing. She'd been showing signs of age lately--she fell recently & I had to help her up--so I thought that perhaps she'd decided to spare us the grief of finding her lifeless body & crawled away somewhere to hide for her last moments. This afternoon, when I was in the room where she usually hung out, I decided I'd write about her, finally: an obituary of sorts, here on the blog. Then I turned around & discovered that she was still here! She'd set up camp in a new corner of the room. I admit, it made me happy to see her & know that she hadn't died. Yes, our secret pet is a spider. 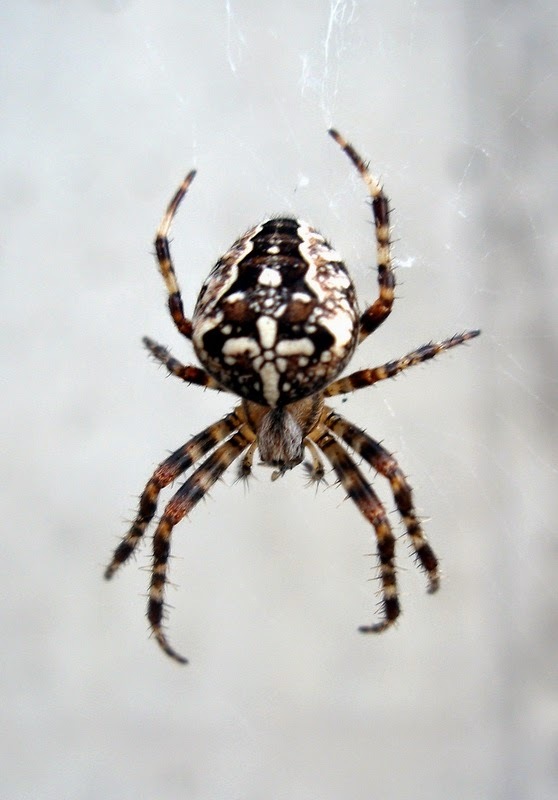 A female orb weaver, Araneus Diadematus, to be exact. She just appeared one day in the bathroom window & after I noticed how many bugs she was eating (we had a fruit fly population explosion at one point last summer), I decided to let her stay. We weren't on great terms initially, as she kept building her web across the bathroom window. This is the only method of venting damp air out, so we have to open it every time we shower. I lost count of how many times I got sticky web tangled on my fingers when I blindly--I mean that fairly literally, given how myopic I am--reached for the window to open it, forgetting that there was a spider web across it. Eventually--I forget how long it took--the spider & I reached a compromise. She built her web across the unmoving side of the window, attaching it to a rubber ducky sitting there on the sill, rather than the frame of the sliding pane. I, in turn, held off on cleaning that side of the window. Through the summer, our spider grew bigger & bigger, from her original size smaller than a kernel of corn, to her current size, her body about as big as a cooked chickpea. The distinctive cross markings developed & became clearly visible on her abdomen. I did see another smaller spider in the windowsill area, who I thought might be a male orb weaver. If he was a suitor, no egg sac ever popped up after his disappearance, so I assume he just became dinner. However, a quick Google search tells me that the females typically leave their silk-wrapped clutch of eggs all winter, to hatch in spring when the weather warms up. So maybe she's just hidden it really well & we'll have a population explosion of orb-weavers in a few months. Perhaps if she sticks around all winter, I'll be able to get a decent photo of her. (the above image is not mine) I avoided it previously, despite fairly good lighting, because I didn't really want all the mildew behind her web to be on public display. Heh. Now that she's moved, her perch is in one of the darkest corners of the bathroom, so I'm not that hopeful I'll get a decent photo, given the lighting conditions. So, what do you think: is this the weirdest pet you've heard of, or do you want one or your own? She's very low-maintenance, I have to admit, & helps take care of nuisance insects. Would you leave a spider in your house, or would you chase it outside?